and module fields to meet new customers in the lighting domain and increase business. 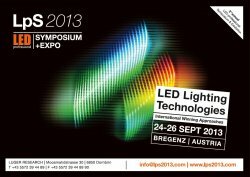 The symposium covers LED and OLED lighting technologies for luminaries, lamps, modules and components. It focuses on new system approaches, new components, equipment and upto-date design methodologies that companies from all over the world showcase at the exhibition.